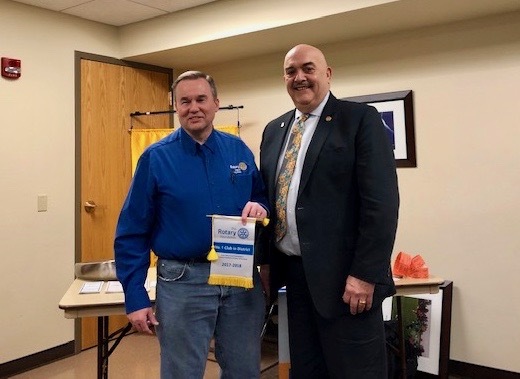 We are grateful to Past District Governor, Don Brewer, for being on-hand this morning to proudly present the Rotary Club of Cary-Grove with three separate awards. The first most notable award was for being 1st in the District for Foundation Giving. Out of approximately 72 clubs in our District, being No. 1 is a significant accomplishment. The second award was The Rotary Citation (formerly the Presidential Citation). This award was given to the club for meeting specific goals outlined by the District at the beginning of the year. The third award was for our "End Polio Now" contribution which was in excess of $1,500. We may be a small club, but our leadership is experienced and committed. Congratulations to all our Members, our Board and President, Pat Finlon, for all their hard work. We are very proud of our members and our leadership.